In Turkish cuisine, there are so many different recipes that use bulgur. In my family, we enjoy it in icli koftes, dumpling style balls with meat filling, bulgur salads like kisir and tabouleh and various improvised pilafs and bulgur balls filled with herbs and spices. I’m planning on making a couple of these dishes to share with you in the future but today I’d like to present bulgur in its purest and, for me, best form: Plain Bulgur pilaf with Yogurt. No scratch that! It hurts to call this dish “plain” in anyway. 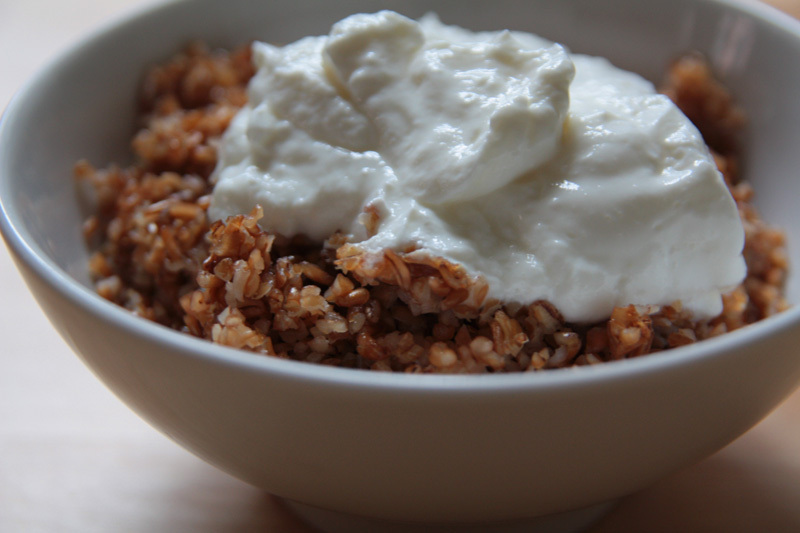 Let’s call it Bulgur with Olive oil and Yogurt. MUCH better. I had this dish for the first time when I was sick around 5 or 6. 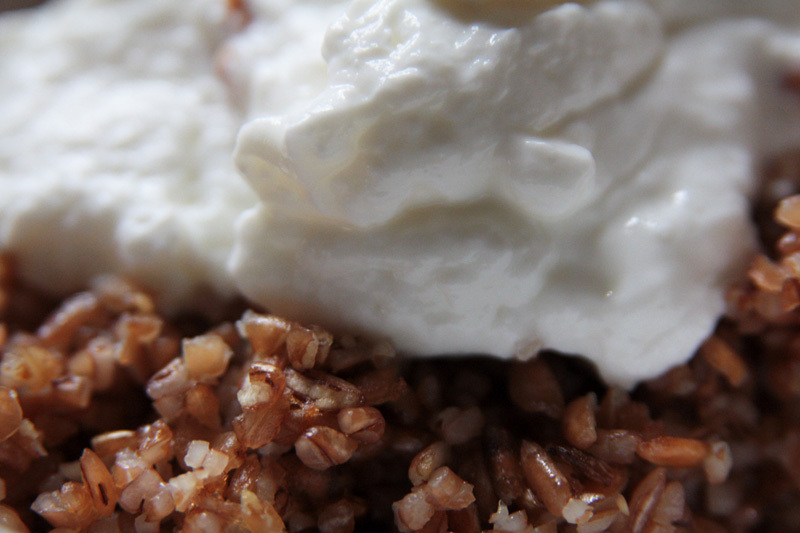 I remember having plenty of rice pilafs with yogurt for as long as I’ve eaten and bulgur had always been a staple in our home. So it seems impossible to me that I had never had it before. But maybe the appetite loss and misery you feel as a sick child, made the discovery of this simple, tasty dish a revelation. I remember the first bite I took and the joy I felt at finding something that still tasted good to me. I remember the glass bowl it was served in and the couch I was lying on. For days afterwards, even after I started feeling better, I pretended I still hadn’t recovered my full appetite and asked for this dish to be prepared for me. And now, if I haven’t had it for a while, it still carries that same sense of revelation. 2- Pour in the water and the salt. Turn the heat to high. Give it one more stir, then wait until the water starts boiling. 3- Lower the heat and cover. In 12 to 15 minutes, the bulgur will have soaked up all the water. Turn the heat off and let it sit for 5 minutes or so with the lid still on. 4- Serve with a dollop of yogurt, strained or normal variety both work just fine. Like the close-up shots of bulghur. I’ve never eaten it with yogurt on top. Good suggestion.